Creativity and a mix of party/household items are all you need to turn your backyard into a colorful carnival. Birthday, anniversary, reunion or fundraiser, a carnival works for any celebration. Assorted sweet and cool treats satisfy and refresh all of your guests. Colorful decorations are part of the fun and excitement of a real carnival, even if it’s being held in your backyard. Paper streamers and balloons along fences, tables and poles add bright splashes of color to the area. A different table/sign color for each game helps make each booth stand out. Large glittery signs for each game give the carnival a professional touch and lets guests know what activity to expect. Any outdoor celebration requires cool drinks to keep guests hydrated in the warm air. 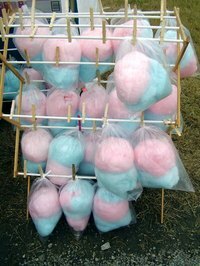 A carnival also requires sweets and snacks to keep guests energized for the games. Cool refreshments can include water, iced tea, lemonade, diet soda and snow cones. Other refreshments can include cotton candy, candy apples, popcorn, corndogs, nachos, lollipops, licorice ropes and giant cookies. Any basic item-tossing game can work for a backyard carnival. A beanbag toss with bee-decorated beanbags and a flower-decorated board with holes in the center of each flower provides an easy game for young children. Prizes for getting a beanbag in a hole can include a flower-shaped eraser, a baggy of honey candy and a water-squirting bee ring. A ring toss with plastic rings and a table covered with colorful plastic rods in assorted sizes provides a challenging game for adults. A point value assigned to each rod determines how well the player did and what prize he receives. Prizes can include a mini flashlight, a compass keychain, cartoon fridge magnet and a mini bottle of scented lotion. Chance-based games give every guest an opportunity to win a prize, regardless of his skill level. A fishing game consisting of a large cardboard wall decorated with fish and stick poles with paper clips on string. The young kid’s fishing game ensures every player wins a small prize. Prizes can include a mini stuffed animal, bouncy ball, animal stickers, pirate temporary tattoos and bottles of bubbles. Wheel of fortune is a chance-based carnival game that kids and adults can enjoy. The wheel consists of a round piece of wood divided into several numbered slices, such as 1 to 20 for an easy game and 1 to 100 for a hard game. Players place a token on a numbered board before each spin and the player with the token on the resulting number wins. Prizes can include silly putty, lollipops, coin purses, flavored lip balms and paddleballs.